During all these years living in England, I have always kept on cooking Chinese food, all the dishes I could remember, — if not on daily basis. But it is hard to remember all of them without being in that environment, you know, seeing all the typical Chinese vegetables in the markets, or tasting traditional home recipes, or without going to local restaurants in China. Saying that, this recipe is one of those “forgotten” recipes. Only a little over a year ago, a friend’s mum invited us over, she made this dish, it jogged my memory. 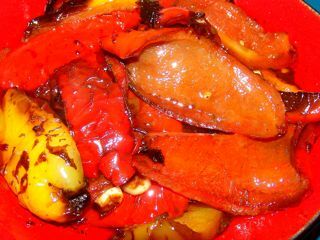 This auntie (in China, you call anyone who is your parents’ peer “auntie” or “uncle”, for showing respect) told me that this red pepper dish is a famous regional dish from the Beijing area. Vaguely, I knew it was a very traditional dish, but I could not remember anything other than that. I had a dream that night — my most beloved auntie was cooking in the kitchen. So, :)) here is the answer I guess. Anyway, so I started making this dish. This time, I found that thick skinned red pepper actually works better for this recipe. 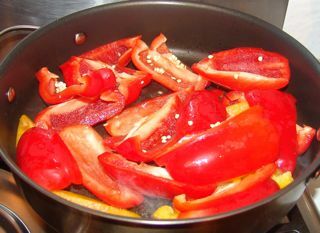 The method of cooking this dish is called ‘Men’, as to cook with covered lid. 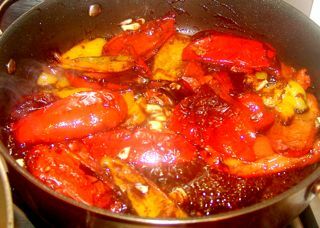 The typical ‘Men’ dishes can be cooked with oil, or with soybean paste sauce. It generally has a very rich taste, but it can be … quite ‘oily’. There is another taste that it is not easy to find in other dishes — a little bit ‘burnt’ taste. Ok, oily and burnt — my dad would never touch this dish, he has been super health-conscious in recent years. It is fairly easy to make. The soyabean paste is an option if you want to use it, otherwise, a few drops of soy sauce can do the job. :) Here it goes. 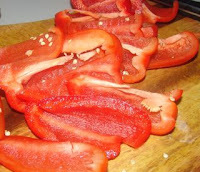 Chop the red pepper into 2-3cm width strips, and chop around 3 gloves of garlic into slices. 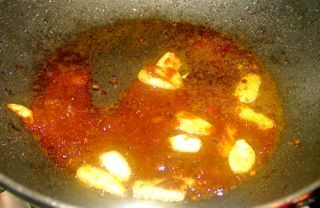 3) Put the empty sauce pan back to the fire, add in around 2 tablespoons of oil, then add in chopped garlic, and 2 full tablespoons of soyabean paste (optional), 1 tablespoon of cooking wine, 1 teaspoon of sugar, 1/2 teaspoon of MSG/vegetable/mushroom/chicken essence (optional), mix well. (If it is still too dry for the soyabean paste, you can add some water).